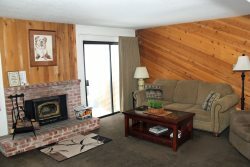 Nice One Bedroom and Loft and Two Bath condominium walking distance to the Canyon Lodge Ski Lift area in Mammoth Lakes. Sleeps up to 6. New carpeting installed fall 2014. Queen bed in bedroom, 1 queen bed and 2 twin beds in the loft, 1 queen sofa sleeper in the living room. 2 Flat Screen TVs (Living Room & Loft), 2 VCRs, DVD, Stereo/CD. Wifi Internet access in the unit. No phone in unit. Aprox. (1050 sq. ft.) First floor is the Bedroom, Kitchen, Dining Room, Living Room and 1 full Bathroom. The second floor is the Loft and the 2nd full Bathroom. The Loft is enclosed except for the stairwell area. This is an upstairs unit...you enter the unit from an enclosed hallway in the Chamonix A Building. Chamonix Recreation room with large screen TV, reading area, ping pong, foosball, and business center with fax, copier, computers w/ internet and laptop hook-up. Sauna, hydro spas, seasonal/summer swimming pool & BBQ area. Laundry facilities. COMPLIMENTARY INTERNET and CABLE TV are provided, however NO REFUNDS will be given for connectivity problems or Internet failure. TOT LICENSE 1968-CX16. This place is the way to go if youre looking for a place to stay. It was overall cozy and tidy, as well as had condiments in the kitchen cabinet. It was a lovely experience! Overall, we were pleased with our accommodations and quite happy with Central Reservations service. Continue approx. 1 mile up Canyon Blvd.